For hair safer hair curlers of the last generation, made of foam, velour, or polymer fibers. They allow you to get predictable curls, and most importantly – preserve hair structure, Shine and strength. Fashion lush curly hair have always been. Even men prefer to flaunt wigs with beautiful curls, and this trend has lasted long enough. Today women of all nationalities and races continue to cheat their straight hair in curlers, putting on the altar of beauty, their strength, Shine and health. And is there a safe hair curlers, not harmful to hair? Metal curlers with rubber bands, this relic of the past can still be found in the depths of closets some women. Scary to imagine, but they were even sleeping! The result of this barbarity was a sore head and electrified hair with split bands ends. Women, having the ability in those days to be dried is wound on a metal curler hair dryer was not in the best position: the metal is rapidly heated, the more damaging the scalp and hair. Hot rollers are close relatives of the electric rollers. Only the first boil in a saucepan, and the second is equipped with an electric stand, in which they bask. Hot curlers are taken to wind dry hair – this method of Curling is more gentle. But if you curl wet hair, it is exposed to high temperatures they will begin to rapidly lose moisture, which negatively impact on their structure. The hair will become more dull, dry, thin and brittle. Curler with natural bristles and hair rollers-Velcro take the form of cylinders with a rough surface, which remain on the hair without additional bracing. These products are designed to give volume to the roots, so it is better to use on short hair. Long thick hair just get stuck in these "hedgehogs". The result can be left without solid parts of hair. Wooden or plastic rods that allows you to curl only narrow strands, would be good, if not one "but": they are the same as the metal counterparts, spoil the hair rubber bands. Recently on the beauty market appeared the foam curler and boomerangs where you can sleep without fear of waking up with a sore head. They can be considered safe for hair. Velvet curler – plastic items covered with velour fabric, allow you to create voluminous hair, maintaining Shine and vitality of hair. And the most recent fashion trends are technologically advanced spiral curler Magic leverage, which translates as "magical effect". 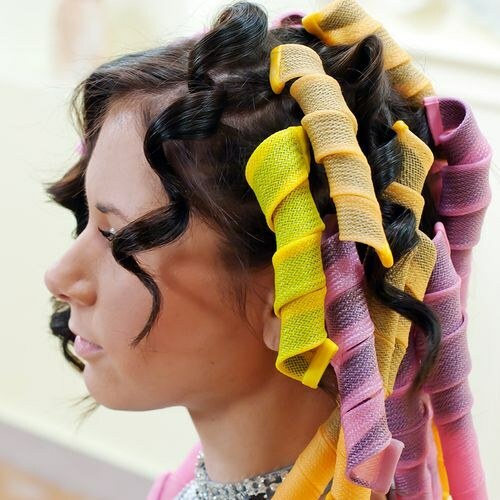 These helical "stockings" of the polymer fibers will help you to create stunning spiral curls. Soft tape absolutely not felt on the hair, allowing you to use them at night. They are easy to use and completely safe for the hair.